The XTENDEX® HDMI Extender via Fiber Optic Cable locates an HDMI display up to 980 feet (300 meters) away from a video source using two SC multimode fiber optic strands. 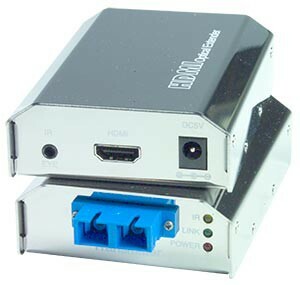 Each extender consists of a transmitter that connects to a video source and a receiver that connects to a display. Also known as: HDMI Optical Extension, HDMI extender, HDMI digital to multimode fiber, optical extender, graphic extension modules, fiber optic digital video extender, balun. The XTENDEX® HDMI Extender via Fiber Optic Cable locates an HDMI display up to 980 feet (299 meters) away from a video source using two SC multimode fiber optic strands. Each extender consists of a transmitter that connects to a video source and a receiver that connects to a display. Signal transmission via two-strand multimode SC fiber optic cable – no RF interference. Compact and durable design – allowing for easy connection and placement. Cascade two extenders to extend up to 1,965 feet (599 meters). Laser automatically becomes disabled if fiber cable is broken or removed. Available with optional Infrared Remote (IR) control – call an NTI product consultant for more information. One female 3.5mm port for optional IR emitter/receiver. One duplex SC fiber optic port for sending/receiving high definition video/audio signals, IR signal, CEC signal, and DDC signal. Compliant with HDMI 1.3b and HDCP 1.1 standards. Auto power save mode when source device is powered off. 980 feet (300 meters) over 50µm multimode SC fiber optic cable. Use a duplex SC 50-micron fiber optic cable to extend the receiver from the transmitter up to 980 feet (300 meters). Storage temperature: -4 to 158°F (-20 to 70°C).